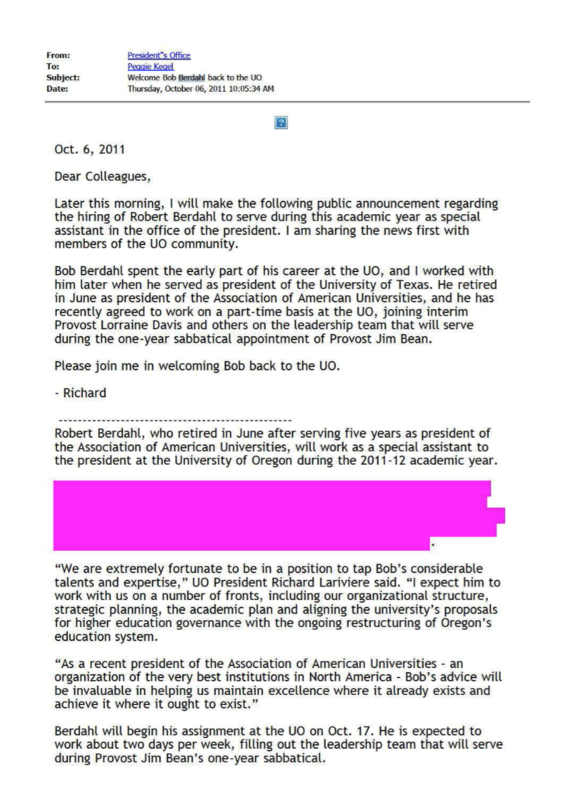 In January Interim President Scott Coltrane claimed that my request to the UO Archives reference desk for copies of the UO Presidential Archives led to the “unlawful release” of thousands of pages of documents – most notably a memo from then UO General Counsel Randy Geller to then Interim UO President Bob Berdahl proposing that Berdahl dissolve the troublesome UO Senate and replace it with more complacent faculty. 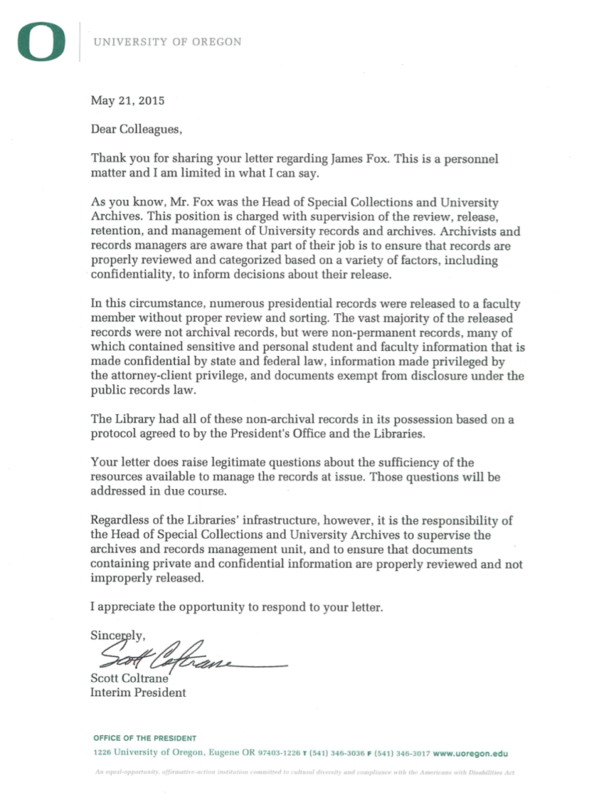 Coltrane or his lawyers persuaded new UO Library Dean Adriene Lim to break the American Library Association’s ethics code on the confidentiality of circulation records and out me as the source of this memo. VP for Academic Afffairs Doug Blandy then threatened me with discipline if I didn’t return the records. I did, and so, in need of a new scapegoat, Coltrane fired longtime UO Archivist James Fox – a guy I’d never even heard of, much less conspired with. As with so many other Coltrane decisions, that turned out to be a big mistake. While I didn’t know who James Fox was, plenty of other people did. 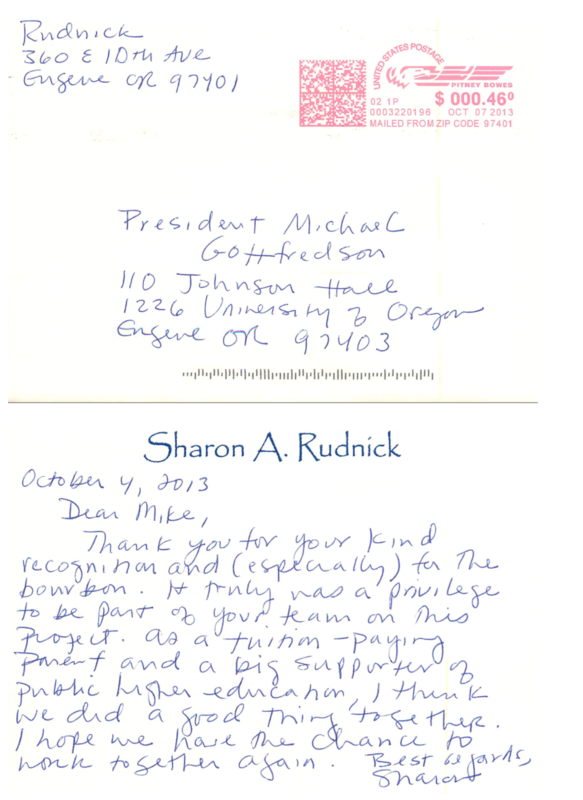 Coltrane’s Fox firing was protested by an editorial in the Register Guard, an RG Op-Ed from none other than Ursula LeGuin, an open letter from ~130 UO faculty, and a letter from the Oregon branch of the AAUP. The “incident” was the subject of many stories in the RG, Oregonian, The Chronicle of Higher Education, and more. The university has not yet released the terms of the settlement agreement – I’ve made a PR request – but presumably it paid some financial compensation to Mr. Fox. I hope it was a lot. UO has now posted redacted copies of the Presidential Archives that I returned to them, on its Public Records website. They’re available on request from UO Public Records Officer Lisa Thornton here. I’ve only glanced through these, but I think the redactions made by the public records office can best be described as “erratic” and possibly as “unlawful”. The letter from the UO Archives giving me the original archives explicitly warned me that the files still contained confidential information and that if I disclosed it I’d be in trouble. 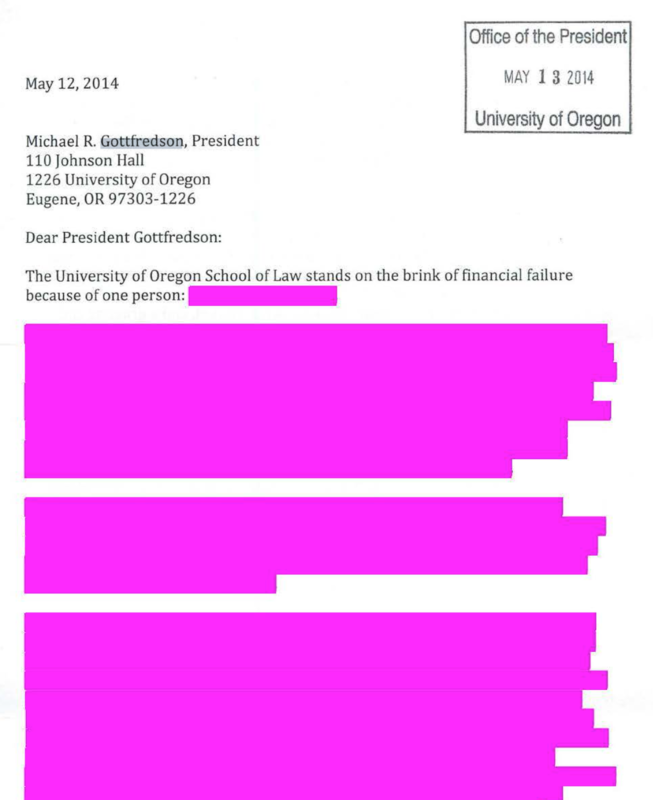 UO’s Public Records Office has left a lot of what looks like confidential – or at least personal and embarrassing – documents in their sanitized release, and they include no such warning. That’s right, Dave Hubin and Lisa Thornton have redacted a press release. You can get the full text from “Around the O”, here.Does this mean Around the 0 has been posting unlawful press releases, or does it mean the PR Office has been making illegal redactions? Appalling. I’m guessing pink = “personnel records” because the usual catchall “frank communication” exemption is yellow. Trouble is, there is no exemption for “personnel records,” unless ORS 192.502(2) is taken to a ridiculous extreme. This has to stop–isn’t is a matter of public interest to know how people are hired and how they are doing their jobs? And that sounds like BS to me also. Can you tell me what exactly a “faculty record” is and which section of the ORS exempts them from disclosure? ORS 351.065 talks about personnel records. ORS 351.065(12) talks about personnel records designated as confidential not being public records under ORS Chapter 192. The old State Board of Higher Ed had rules to implement this statute. All of the universities still protect faculty records as confidential. The UO Public Records Office generally only protects faculty records when they want to. There are many examples in the archives that Hubin and Thornton just released. Yes–which raises the question of why the entire personnel file of any “faculty” member should be designated as confidential in the first place. Hubin has not been involved with Public Records for some time now. It brings to mind that old saying “You can’t fix ‘stupid'”. “The Office of Public Records will transfer from the Office of the President to the Office of the Vice President and General Counsel when the now advertised position is filled. Lisa Thornton, public records officer, will report to the president’s chief of staff in the meantime.” from President’s office June 16, 2015. Wow – did not see that! Where was this info posted? Around the O? This marks a major demotion for DH in my opinion. Admittedly, given the “stupidify” ray that seems to strike once a person morphs into a Johnson Hall role, this latest news once again gives me hope (faith?) that our new Prez is cleaning house and starting a-fresh, as he desperately needs to /should do given past history. Thanks for the good laugh before bedtime! What a hoot. As a non-admin employed in the library, I have to say that your take on the treatment of James Fox as a scapegoat is just wrong. It also, unfortunately, in my opinion, hurts your credibility to those of us who know better. James Fox was an awful manager who presided over a dysfunctional and toxic work environment. The UO Libraries are much better off moving on from the mismanagement of Mr Fox, and most librarians here are acutely aware of this. Notice no-one at the library mourning his loss. In fact, if you pay attention plenty of us have been rejoicing in it. The question on the table is whether he deserved to be fired for his role in releasing the Presidential Archives to me, and to have Interim President Coltrane have him escorted from his office by the UO Police, and then tell reporters that his decision to release the archives was unlawful, etc. I think those penalties were wildly disproportionate, and were imposed because the archives release embarrassed the UO administration and its lawyers. Mr. Fox may have been a bad manager in other respects. I don’t know. But the way he was treated because he released the archives should be of concern to everyone who works at UO or cares about UO or academic freedom. Does that mean that you wouldn’t be worried that providing material from the university archives could cost you your job, even if you were following library policy? That’s not exactly what happened, just a simplification. From the outside I can see how it looks like that. Fox said that at one point in his UO career, top Libraries administrators told him he was a terrible manager. In response, Fox said, he summoned the courage to request a “360 review” by Bruce MacAllister, university ombudsperson. Fox – on the advice of his attorney, who said MacAllister’s Power Point 360-degree review summary was unintelligible out of context – declined to release it. Fox said the report found areas for improvement, but concluded he was doing the job of two-to-three people.